On Friday, Michael Cohen said something during closed door hearings that prompted Democrats on the House Intelligence Committee to publicly categorize it as a game changer. Now we’re finding out what it is, and let’s just say that it definitely involves Rudy Giuliani, and it probably involves Rudy going to prison. On Saturday, the Washington Post reported that Michael Cohen’s revelation to the committee on Friday had something to do with pardons. Now the Wall Street Journal is reporting this evening that after Michael Cohen’s office was raided, Cohen’s former attorney spoke with Donald Trump’s attorneys about the possibility of a pardon. In response, Rudy Giuliani told Cohen that Trump might pardon him down the road. This is felony obstruction of justice on Rudy’s part. 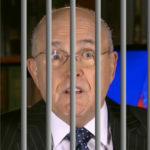 This is a three ring circus, but there’s only one conclusion here: the SDNY is criminally investigating Rudy Giuliani. Follow the logic. During Cohen’s public testimony on Wednesday, he revealed that the last interaction he had with Team Trump was a couple months after the FBI raided his office. When Cohen was pressed for details, he said he couldn’t go into it, because the SDNY is actively investigating the matter. Then on Friday he privately told Congress that after the raid, Rudy Giuliani dangled a pardon. So now we know that the SDNY is targeting Rudy over the pardon incident. While it’s been clear for some time that SDNY is targeting various Donald Trump associates in general, this marks the first confirmation that SDNY is targeting someone in Trump’s current inner circle, for crimes committed on Trump’s behalf. It’s time for Rudy Giuliani to cut his plea deal, if he hasn’t already.